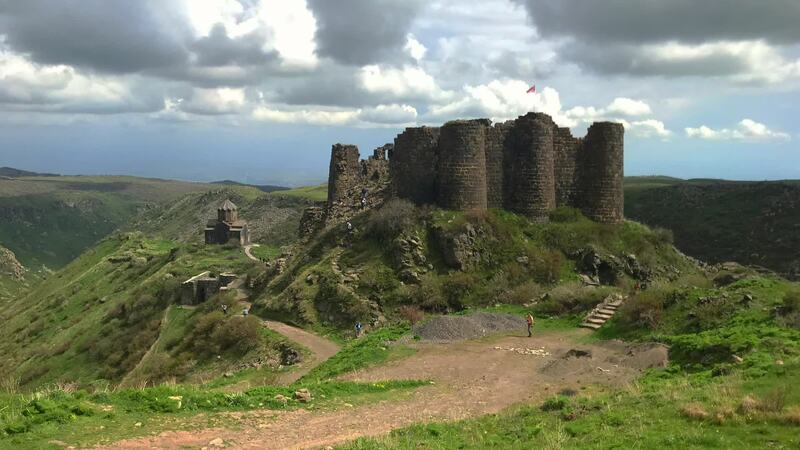 Description: Amberd is a 7th-century fortress located 2,300 meters (7,500 ft) above sea level, on the slopes of Mount Aragats at the confluence of the Arkashen and Amberd rivers in the province of Aragatsotn, Armenia. The name translates to "fortress in the clouds" in Armenian. It is also the name incorrectly attributed to Vahramashen Church, the 11th-century Armenian church near the castle. The village of Byurakan is 6.4 kilometres (4.0 mi) from the site of Amberd. The site started as a Stone Age settlement. During the Bronze Age and Urartian periods, a fortress had been built that is now obsolete. Some sources say that Amberd used to be a summer residence for kings. The castle of Amberd and some sections of walls were constructed in the 7th century as a possession of the noble House of Kamsarakan. Four centuries later the fortress and surrounding lands were purchased by the House of Pahlavuni and rebuilt by Prince Vahram Vachutian Pahlavuni, as is recorded in the manuscripts of Grigor Magistros Pahlavuni. Vahram built the Church of Surb Astvatsatsin in 1026, fortified the complex with thicker stone walls, and added three bastions along the ridge of the Arkhashen canyon. Despite being unusual for a military installation, a bath house was built in the same period and has remained moderately intact along with the water supply system. Amberd was invaded in the 1070s by the Seljuq Turks who turned it into a military base. In 1197, a joint-army of Armenians and Georgians led by General Zakareh Zakarian liberated the fortress. Under Zakarian control during the 12th and 13th centuries, the walls were structurally reinforced and the castle and outer buildings were renovated. The noble Vacheh Vachutian purchased Amberd in 1215, making it a key defensive site in the region. Within a short period of time, the Mongols captured and destroyed the fortress in the year 1236. The site remained abandoned and untouched until the 20th century, when reconstruction and archaeological excavations began. The castle ruins of Amberd comprised an area of 1,500 square metres (16,000 sq ft). Its walls are constructed of roughly hewn basalt blocks set in place with mortar. Tower walls are inclined to have made it easier to fire on invaders below. The interior of the castle had three-stories, each floor separated from one another by wood planks clinched on logs. There were five rooms in the first and second floor, each arranged in a row where one would enter each room through the previous room. An irregularly shaped hallway was separate from the three internal rooms by an internal wall. On the third floor were the reception areas and private rooms for its royal inhabitants. The structural configuration is thought to have not changed since it was first built in the 7th century. Excavations have shown that the interior of the castle and rooms were quite lavish with elegantly carved decorations in the rooms, oil lamps, incense holders, and walls decorated with silks and brocades, and with bronze, gold and silver ornamentation.